Peak Freak Expedition members are privileged to enjoy the rare opportunity to take a special blessing from the highly regarded local expert on all matters of Buddhism and life in general. 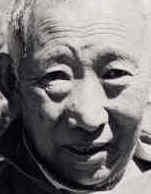 He is Lama Geshe who came to Pangboche from Tibet during the Cultural Revolution in China when Tibet was invaded. He now makes Pangboche his home where there is a very old gompa, the oldest in the Khumbu. This Gompa also houses the Yeti scull that is kept in a glass case for trekkers and climbers to view should they make it up this way. 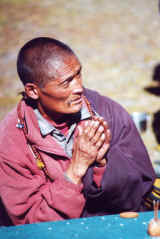 His blessing are known by our climbing sherpas is to be thoughtful and powerful. Our teams are invited on a unique and personal level to enter his home with our sherpas where he performs the sacred ritual. Our members are offered greeting cards in which he writes in Tibetan “good wishes and good luck” and instructs us to take them to the top of the mountain so that you could commit them to the goddess there for good luck and success on Chomolungma (Tibetan for Everest) and/or Sagamartha (Nepalese for Everest) or any other Himalayan peak for that matter. He offers some sungdhis, which are the little red cords which climbers put round their neck, and a kota (silk scarf ) also for good luck. 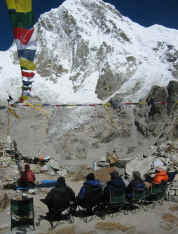 After lunch and tea the team will make there way to Base Camp to begin the climb. At base camp after everyone has arrived and the team is ready to climb we are visited by another Lama. Lama Da who comes from Tengbouche to perform the Pujah Buddhist ritual where he will bless our gear, climbers and more importantly the sherpas. The Sherpas will not go up on the mountain until this ritual has been performed. During the ceremony all the expedition equipment that will be used on the mountain needs to be blessed. All climbing hard wear, boots, rope, tents, and food. The juniper will be lit to smolder at the alter that is built up with stone and prayer flags are attached to it by our sherpas. The smoke will rise to heaven’s sending the good wishes. Westerners have various beliefs but all willing participate in this entertaining and meaningful event. Lama Da will take some of the expedition food and make a temple of sort, made of rice, popcorn, cookies and beer as part of the offering. During his chant and readings we are given Tsampa (a roasted barely flour) for tossing followed by festive food we eat. It is very fun and a good chance to get to know more about your new life long sherpa friends.